i’ve divided my project in multiple LUA modules but it seems that the editor autocompletion doesn’t work with them. Standard libraries (go, tilemap, etc) work. Imported 3rd party libraries (Monarch, Rendercam) work. My modules (lua modules files in the project) don’t work. Hmm, you should get autocomplete for those… Could you try renaming from MO to monarch and try if that makes any difference (unlikely but worth trying). MO (or monarch) works, all imported libraries do. 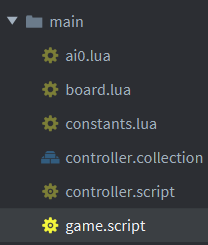 How are your own Lua modules setup? Can you post an example? local CO = require "main.constants"
local BO = require "main.board"
local UT = require "main.utils"
Try function M.think(player, boardValues) instead. Also module values do not auto-complete. It has been requested before. can’t we have autocompletion to work in either way ? This is a limitation of the current Lua parser. We’ve started looking into how it can be improved, but are busy working on other areas of the editor at the moment. should i create a ticket on github for this?